Ever try on a dress in a store and think, “If only they made the (fill in the blank) different?” That was the inspiration which lead to the magical waist whittling Gertie dress. Being drawn to ruffles, I tried on a blue chambray dress while out shopping. I loved the bodice, with its neckline ruffle, but the skirt was less than flattering. It was gathered at the waist, cut very straight and somewhat narrow. Definitely made for a body type different from mine, but I really liked that neckline ruffle. 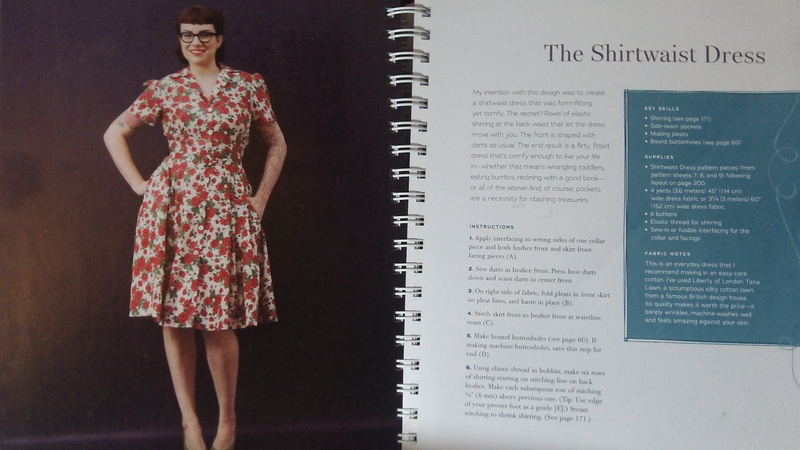 Enter the Gertie’s New Book for Better Sewing, by Gretchen Hirsch, a favorite sewing blogger. I’ve had this beautifully illustrated book for almost a year and it was time I stopped looking and starting making. Her smartly drafted shirtwaist dress had the perfect silhouette, minus the collar and sleeves. While looking for fabric, blue turned to black when I figured out blue chambray may look too much like denim to get away with at work. I ordered a Robert Kaufman black chambray from Fabric.com, which arrive quickly enough to keep me motivated. The Gertie pattern was so easy to follow. I made a muslin for the bodice, using the size 8 and made my regular petite adjustments. Instead of sleeves, I cut facings and redrafted the neckline a bit to accommodate the ruffle. 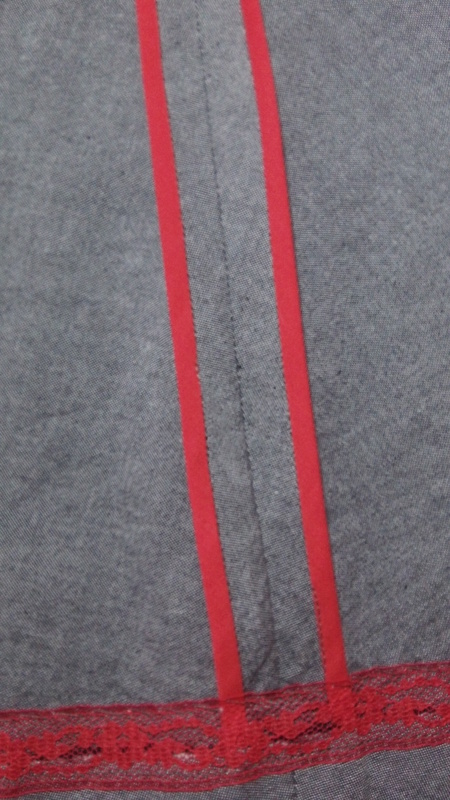 The back has shirring at the waistline and is done with elastic thread in the bobbin. Since this was my first attempt at that technique, I practiced on the muslin. Being much shorter than the length of the finished dress, the waist-whittling was not obvious on the muslin. Once the dress was far enough along to try on, it was an oh-my-goodness moment. I knew a shiny red belt would be the perfect accessory. The shopping karma was with me on the belt, which then inspired the red bias tape for a Hong Kong finish, another first time technique for me. This dress is so comfortable, with great pockets. With a sweater, it should work well into fall. Full disclosure, I’m not a skinny as the dress form, but the dress still makes my waist look good. Now I need to find the perfect fabric to make it again, in the original version. Beautiful! Will you be doing a photo shoot of yourself wearing the dress? Thanks, I was going to try when I wore it out to dinner with a friend visiting from NYC. We got so busy chatting I completely forgot. He suggested a version in black, to be worn with pearls. Ooh, that would be lovely! Pearls are such a classic. Ha ha, I know, it’s easy to forget the photo shoots. I’ve done that several times–got all dressed up, went out with my hubby, and then completely forgot to have him take pictures. Wow! It doesn’t look like a muslin at all. I want those finishings… Can you recommend a book that explains how to make these? Thanks, I have to admit I went through 3 different books before I attempted the Hong Kong finish. I like see different examples before trying something new. I looked at Vogue Sewing, which uses illustrations, Palmer & Pletsch Couture, also illustrations and a lot of big shoulder 90’s fashion. The Threads Sewing Guide has nicer color illustrations and many of the other subjects they cover have color photos. If I had to pick one, it would be the Thread’s book, which is also the most recently published of the three. All the books say to make your own bias, which I did not. I found it in a box of old sewing notions someone gave me. Funny, all that time on trying to figure out the proper way to do a Hong Kong finish and the neck ruffle was just improvised. I love this! Well done for adding your own features! This is lovely! How did you finish the bottom part of the dress? 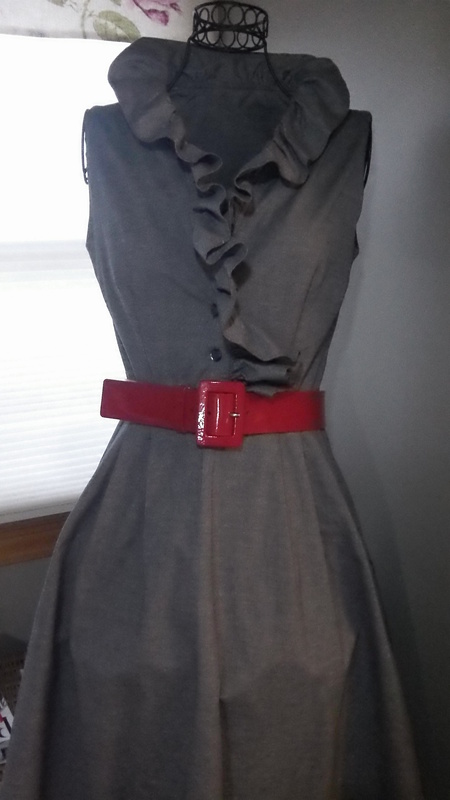 I don’t see any buttons below the belt – is the skirt just one piece in front? Thanks and yes, the front of the skirt is one piece. 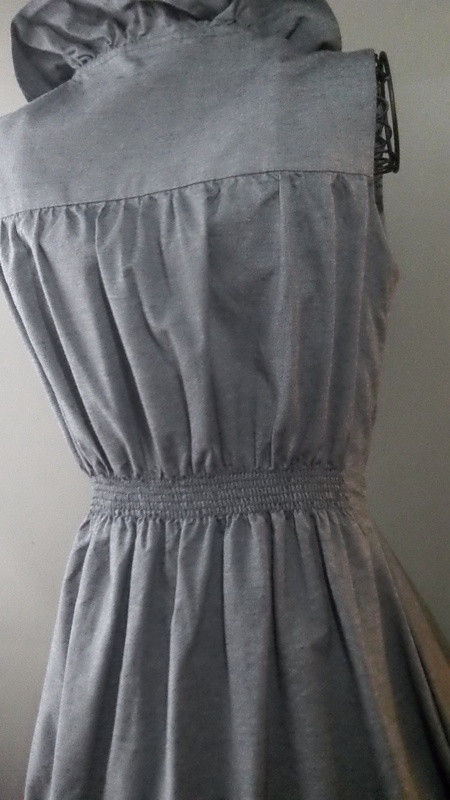 There is so much ease in the back, with the shirred waist, a front opening is not needed in the skirt.